Cooking can be a recipe for building relationships and learning important life skills. Working together in the kitchen can be a satisfying experience for parents and kids. The kitchen provides a perfect learning environment for children while providing a bonding experience for parent and child. Cooking together can be a recipe for building relationships and learning important life skills. Learning is not the only benefit children receive while cooking with parents. Studies show that children also are less likely to abuse drugs in the future as a result of spending time with their parents while they are young. • Wash hands for 20 seconds before and after cooking and after handling raw meats or uncooked eggs. • Rinse fruits and veggies thoroughly with cool, running water before preparing or eating. • Avoid sneaking tastes of any food that includes raw ingredients such as eggs. • Use dry pot holders when working with warm foods or liquids. • Closely supervise the use of knives and other kitchen tools and equipment. Take time to follow these few tips and you and your child are well on your way to a great cooking experience. Question: I have three great kids, ages 3, 6 and 9, who love to help in the kitchen. What are some jobs they can help do? When considering what jobs your child can help do in the kitchen, always consider safety. Try making a pizza such as the one in the recipe we’ve provided. This easy recipe gives your children the opportunity to help in the kitchen. For example, allow your 6-year-old to start by spreading the pizza sauce onto each of the tortillas. This can be a difficult task, so remember to be patient. Next, your 3-year-old will have fun sprinkling cheese on each pizza. This could get messy, but remember to be understanding. Once they each have put on the toppings they desire, allow your 9-year-old to carefully put the pan into the oven, with your help, of course. 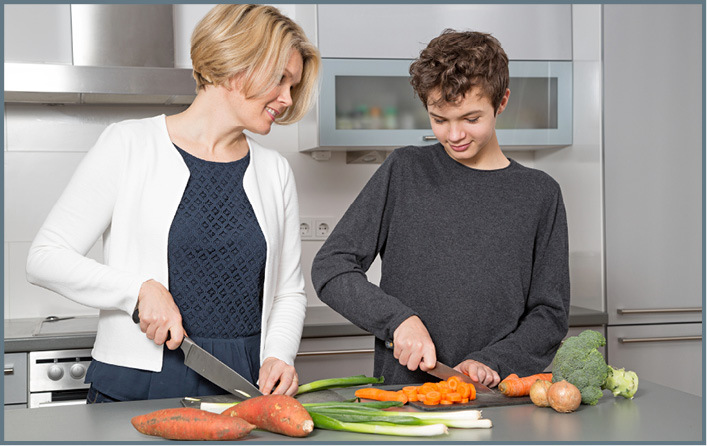 As your children continue to grow older, you may give them more responsibility in the kitchen. Be sure that each child also gets a cleanup task. These tasty individual pizzas create a great opportunity for letting your child help in the kitchen. Let each child make a personal pizza with whichever toppings he or she likes. Lay tortillas on an ungreased cookie sheet. Spoon tomato sauce over each tortilla. Top with minced garlic. Next, sprinkle each pizza with an equal amount of mozzarella cheese. Layer the cheese with peppers and onions and any other vegetable or toppings you like. Bake at 400 F for 10 minutes or until the cheese is bubbly. Serve. Each serving has 300 calories, 10 grams (g) fat, 17 g protein, 34 g carbohydrate, 3 g fiber and 360 milligrams sodium. Quick Tip: Try a game after dinner tonight. See who can clean up his or her place setting the fastest. Dinner cleanup will be done in a snap, and you will have more time to spend with your family.